Add adventure and active play experiences to your outdoor space. 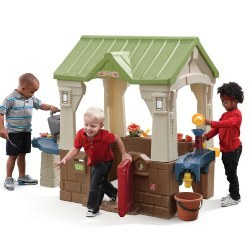 These sets come in a variety of sizes and designs to accommodate all ages and abilities. 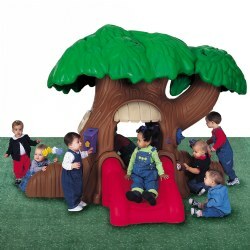 Products include picnic tables, fun house, tents, climbers, and tree house for numerous play experiences. 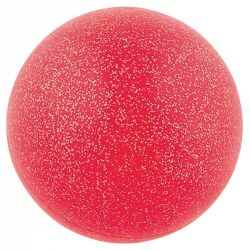 Bouncy glitter ball measures 3 1/2" in diameter. Made of safe and high quality materials. Color will vary. 3 years & up. Climb on, over, in and around this giant caterpillar. Comes complete with four sections that can be configured many different ways. Made of heavy duty plastic, and easy to assemble - no tools required. Overall measurement 7' long from tongue to tail with 20 1/2" opening at each end. 42"H x 41"W x 88"D.
2 - 6 years. Climbing wall and ladder with integrated hand holds assist when climbing. 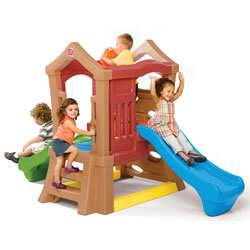 Large, two-tiered platform and two slides provide loads of sliding fun. Rotating steering wheel for pretend fun. Measures: 61"H x 53"W x 84"D. High orange platform approximately 27"H and low blue platform approximately 20"H. Assembly required. 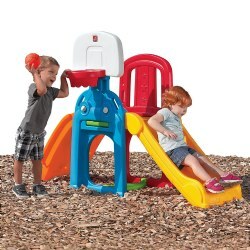 Does not meet CPSC or ASTM standards for public playgrounds. 3 - 6 years. 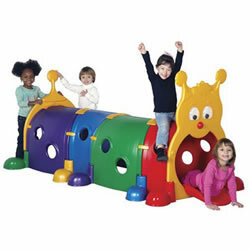 Catch the wave as you crawl, climb, and balance on this unit. 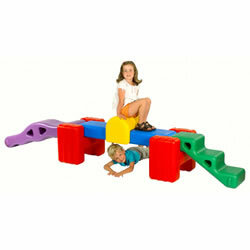 Includes 2 "U" slot-in blocks, 1 mini bridge, 1 wave, 1 set of steps, and 1 balancing beam. Can be configured into multiple shapes. Approximately 24" high. Does not meet CPSC or ASTM standards for public playgrounds. 3 years & up. Move them and watch as the fascinating sparkling stardust swirl around the inside of the balls. 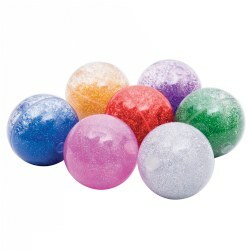 Included: 7 Sensory Rainbow Glitter Balls in Red, Silver, Gold, Green, Blue, Pink, and Purple. 2 years & up. 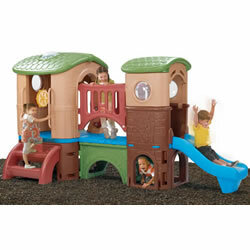 Children will enjoy hours of fun in this playhouse, activity center, and climber all in one! 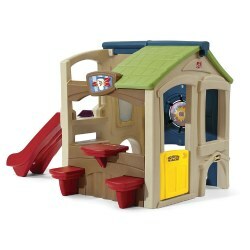 Activity station features a hook and loop target board, 2 balls, ring toss, 4 rings, and a crawl thru rotating door that leads to the slide and playhouse. Diner features large service window, outside counter, and 2 attached stools. 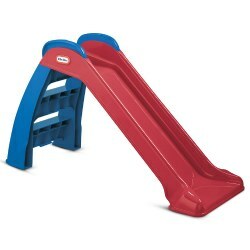 Wavy slide design adds to excitement while playing. Adult assembly required. 58"H x 84"W x 63 1/2"D. Does not meet CPSC or ASTM standards for public playgrounds. 18 months - 5 years. 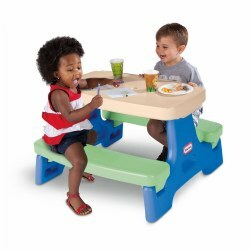 The Little Tikes Easy Store Junior Table with Umbrella is just the right size for toddlers. The portable design requires no tools - just fold and go. It wipes clean easily and is perfect for indoors or outdoors. 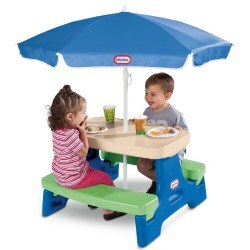 The table seats up to four children and features an umbrella with UV protection for shade during playtime. Umbrella is removable to bring indoors or to store away. 50 lb. weight limit. 2 years & up. Endless playtime opportunities are guaranteed with this all-in-one sports climber. Teaches children to toss, shoot, and kick on a target. Climbing ladder provides a safe and easy challenge for toddlers. Includes a multi-sport ball. Adult assembly required.